Previously: Impact World Champion Austin Aries defending against Pentagon Jr. and Fenix in a triple threat was announced as the new Redemption main event last week. 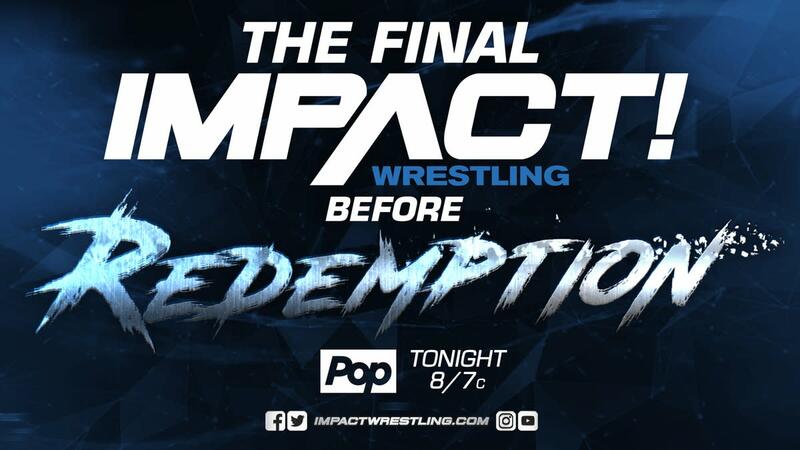 Tonight: It’s the final Impact before Redemption. Yung hit a dropkick to Bahh to gain the advantage. She then hit a flip dive off the apron on Bahh, but Hogan got the hot tag and ran wild. She took out Sutter with a tornado DDT. Yung hit the Panic Switch on Hogan for the win. After the match, Allie ran down and jumped Yung. They brawled up the ramp. - At the LAX Clubhouse, they discussed their title defense at Redemption. Konnan speculated that Scott Steiner might be too much for Eli Drake to handle. - McKenzie Mitchell interviewed Jimmy Jacobs and Kongo Kong. Jacobs promised that Kong is going to defeat and disfigure Johnny Impact later tonight. Angle set up for a moonsault off the top turnbuckle, but Roode caught him with a German suplex. Roode locked on the crossface before Angle countered into the ankle lock. Roode countered back into the crossface. Angle hit the Angle Slam for a close near fall. Roode fired back and scored a very close near fall of his own with the fisherman’s suplex. Angle hit the Angle Slam and held the rope for the win. - KM came out and issued an open challenge but wants to face guys like Brooklyn Brawler, Barry Horowitz or D-Ray 3000. This brought out Brian Cage, which is not what KM wanted. Cage executed a deadlift superplex, an elbow off the top, and a discus lariat. He won using a version of the F-5. Kong used his weight and size advantage to gain control. Impact made a comeback after Kong missed a leg drop, hitting a standing Shooting Star Press for a near fall. Kong nailed Impact with a cannonball on the floor against the steel steps. Kong and Jacobs set up the steps on the apron. The referee tried to stop them, but Kong threw him into the guardrail. Kong then threw Impact face first into the steps like a dart. Impact’s nose and mouth were bloodied up. This was a non-title match and the main event from Impact vs. Lucha Underground two weeks ago from New Orleans. It was a last-minute change after Alberto El Patron no-showed. Fenix sent Pentagon to the floor and attempted a dive, but Aries cut him off with a missile dropkick. Pentagon then attempted a dive, but Fenix nailed him with a rolling cutter. Aries took Pentagon out with a suicide dive. Fenix followed with a springboard twisting dive to the floor. Pentagon and Fenix worked together and used a series of double-team moves on Aries. Fenix and Pentagon traded stiff chops in the middle of the ring. Aries got involved and threw some chops, but Pentagon and Fenix worked together again and took him out with a double superkick. Pentagon nailed Fenix with a pop-up flip powerbomb for a near fall. He then hit the Pentagon Driver on Fenix for the win.